Click here to see photo. It’s typical in Istanbul to be walking on an empty street, just enjoying the day, when out of the blue the shriek of a taxi’s horn shatters the peace and quite. It’s an annoying problem, these overzealous taxis that compete fiercely with one another for business, often swerving across multiple lanes of traffic just to pick up a rider. However, soon pedestrians strolling the streets won’t have to deal with the unwanted and aggressive solicitations from taxis. That’s because the Istanbul Metropolitan Government has announced a new plan to centralize control of all taxis. The taxi’s will be placed under the control of a single company, which will equip them with GPS systems and relay a customer’s call to the taxi closest to that customer’s location. Now, the significance of this news lies in the shear numbers of taxis that ply Istanbul’s streets. 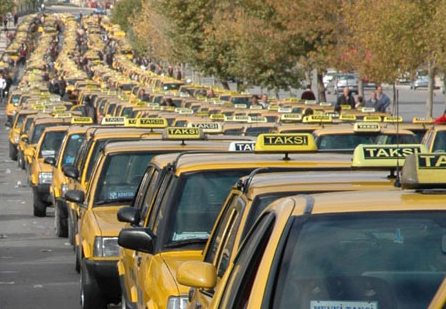 Officially, there are some 18,000 registered taxis in Istanbul. Yet, according to this article (it’s in Turkish) there are as many as 25,000 unregistered taxis, known as pirates, in the city. That makes a grand total of 43,000 taxis! From informal interviews with taxi drivers, we know that one taxi drives between 250-300 km per day. 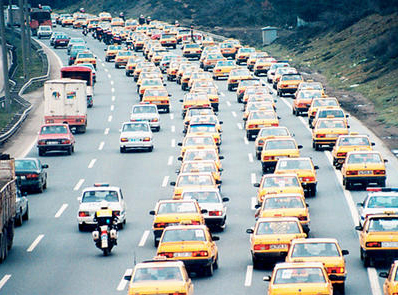 A rough estimate shows that all taxis drive a whopping 10,750,000 to 12,900,000 km per day! Because much of this driving is done just to find customers, the new system will dramatically reduce the distance that the average taxi drives. This is really significant in terms of fuel savings, improved traffic flow, and improved air quality. I’m sure it will take time for Istanbul’s residents to get used to not being able to hail a cab off the street. Most likely I will be one of these. But by slightly adjusting our personal behaviour and travel preferences, I’m sure that we’ll discover that our home is a more livable Istanbul.